Service, it’s what we’re about. Our fraternity was founded on principles that help to support musicians and musical communities. We aim to foster camaraderie in these musical communities and advance music as an educational subject through cheerful service to these communities. 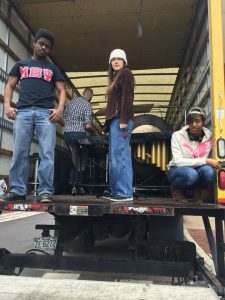 In a practical sense, we do the background work for many of the wonder ensembles and musical groups at N.C. State University to help them perform their best. We set up shells, risers, chairs, and stands for Music Department concerts, help with ushering, and organize our own annual Acapella concert named ‘Acapella Fest’ in Stewart Theatre of Talley Student Union in order to benefit other music related organizations. Our fraternity enjoys a rich history of music service and have been serving the N.C. State music department and other arts at N.C. State since our founding in 1925. Another of our service traditions at Alpha Chapter is to give aid to the ‘Power Sound of the South’, N.C. State University’s marching band at home football games. We assist the band staff in setting up water coolers, carrying equipment from the buses to the field, holding ladders on the field during shows, and working with the band directors to ensure that the band has everything they need to get the entire stadium fired up. Oh, and we do quite a bit of cheering ourselves.